Wizzywig is a fictionalization of the real-life story of Kevin Mitnick, a famous hacker arrested in 1999. It roughly outlines Kevin’s life, under the changed name of Kevin Phenicle. It’s split between narrators and timelines, including first-person, remembrances, and newscasts. It begins when Phenicle is in his early teens and follows through his release from prison and post-release work. I wanted to like this story, but it felt very inconsistent. It didn’t have a stable and unifying point of view or a baseline really to be a touch point. This was my biggest problem with the story, and it caused a number of other problems. For instance, the narrator was often unclear. The switch in voice wouldn’t be clearly marked or easily noted. The plot sometimes felt meander-y. I also often didn’t feel like Phenicle was a character that could be empathized with. It wasn’t always clear what was really motivating him or why he was taking certain steps. Similarly, I didn’t think that Piskor was clear on the extent of the damage that was being done to the people Phenicle was close to. The most interesting part (remember that I’m a sucker for editorialization) was the commentary thread throughout about the nature of technological development and the attacking of those who want to explore and push the boundaries of it. The art wasn’t my favorite. It’s simplistic and not overly imposing. Overall, I liked it well enough, but didn’t think it was fantastic. I thought the book overall is a 3 out of 5. Mostly just sufficient for what it was, but not outstanding. 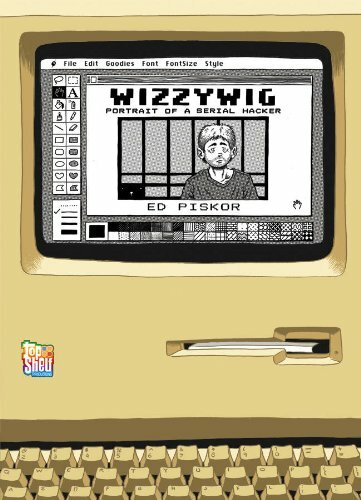 I received a copy of Wizzywig for free in exchange for an honest review for netgalley. This entry was posted in Graphic Novels and tagged Ed Piskor, Free Kevin, Graphic Novel Reviews, Graphic Novels, Hacking, Kevin Mitnick, Phenicle.